Every Body Question About How Can Hack Facebook Password. 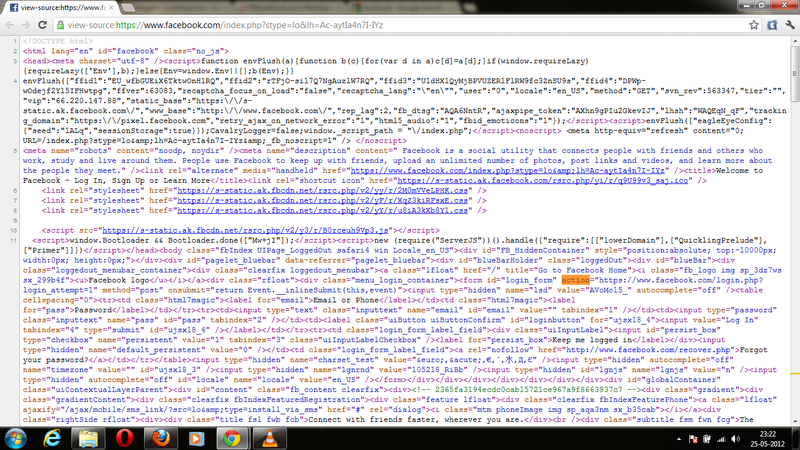 1.Go to the Facebook page ,and then right click on the page, u will see the option view source page,click on that. 2.now a new tab will open which contain a source code,Select all the stuff and paste it in a notepad. 3.Now open the notepad and press CTRL+F and type ACTION. You will have to find a text which looks like ..
6.Now save it on your desktop with the name index.htm,not index.html,remember. 7.Now your phishing page is ready.it will look like a pic given below . 8.Open a new notepad and save the given data with the name post.php. 9.You have two files now one is index.htm and another is post.php,remember file extension is important. You can trick your friend to login this fake facebook page by saying its new version of facebook check it out,or in any way you like.